Vinyl Wall Mural Tape cassette recorder on color background. retro technology. flat lay, top view hero header. vintage color styles. Vinyl Wall Mural Abstract retro geometric seamless pattern. Vector Illustration. Vinyl Wall Mural botanical floral seamless pattern. vector flower print. floral background. textile fabric design. Vinyl Wall Mural Vector seamless pattern with leaves. 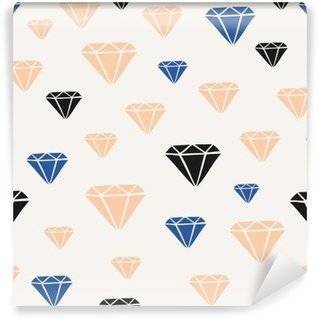 It can be used for desktop wallpaper or frame for a wall hanging or poster,for pattern fills, surface textures, web page backgrounds, textile and more. Vinyl Wall Mural Seamless vintage tiles background with stylized flowers. The reason why we always perceive the past as a bit more attractive than the present is because time is a great healer. Emotions fade and we forget about all that used to anger us and only remember the bright sides. There is nothing wrong with that, it's just how it works. Retro wall murals let us treasure the good memories of long-gone celebrities, events and objects. Vinyl Wall Mural Seamless vintage dots pattern on paper texture. Vinyl Wall Mural Scandinavian floral background, mid century wallpaper, seamless abstract pattern, Blue, silver grey and white colors . 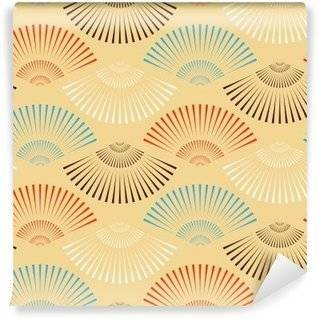 Vinyl Wall Mural Seamless vintage wavy pattern in mid century style. 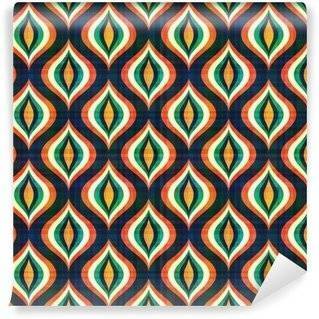 Vinyl Wall Mural Abstract colorful tiles seamless pattern. Vinyl Wall Mural Midcentury geometric retro background. Vintage brown, orange and teal colors. Seamless floral mod pattern, vector illustration. Abstract retro geometric midcentury 60s 70s background. Retro wallpaper. Vinyl Wall Mural Seamless geometric pattern. Abstract wallpaper. Vector background. Retro wall murals are without a doubt one of the most interesting and stimulating out there, because of what's usually on them. 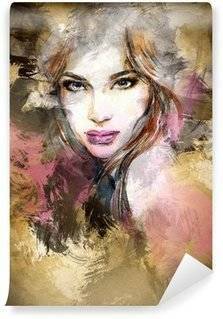 The most popular ones depict famous celebrities, like Elvis Presley or Marilyn Monroe, among others. In addition to being a stylish, trendy addition to one's house, such patterns can help you push through your work or chores – after all, what's more, stimulating than an image of your idol, a successful figure, that reminds you to focus on achieving a similar success? That's why retro wall murals can be frequently seen on the walls of ambitious people who are full of passion and inner drive. However, retro themes are not limited just to famous celebrities of the past. They often depict items of everyday use, iconic for a certain era. We're talking about anything really, from Coca-Cola bottles to women-empowerment posters. There are plenty of retro motifs out there, so instead of listing all of them here, we'd like to invite you to take a look – even if they are not your cup of tea, such a time travel can be very interesting! Retro wall murals work great not only in houses but also in all sorts of clubs, restaurants or coffee houses. Chances are, you've seen them yourself – and if not exactly them, then at least some paintings with retro themes on them. Given the stable popularity of retro, you can't wrong with it if you want to reflect your passion for stylish decoration enhanced with a dose of sense of humour. Retro wall murals are also a great idea for decorating a restaurant or a club, especially if the rest of decoration fits the theme. Red and white tablecloths, old-fashioned cutlery and other complementary elements will work great to create the retro vibe. Just remember and try not to break the immersion – everything has to be cohesive, or else your place will just look mismatched. We did menticoverekon dancing clubs, so just imagine the great atmosphere you can create in such a club by combining retro music with retro wall murals. Such solutions are loved by all kinds of audience. The older one will feel a bit more "at home", while the younger one perceives them to be hip and "cool". Retro patterns let us travel back in time, without losing connection with modern times. They present popular themes from the older days, while still having modern elements – for example, the materials from which they are produced, or the contemporary approach they take at traditional themes. That's why they work best in contemporary houses, whose owners want to show their sentiment for the past. For commercial use, they work best in restaurants like burger joints, where such design moves are very popular.